Weekend mornings were made for being lazy and for homemade pancakes! This easy pancake recipe will start the day off right! My mom asked me recently if I made a big breakfast for the kids every weekend. She looked at me incredulously when I told her that I did not…that we all sort of fend for ourselves on weekend mornings. It’s not that I don’t like making breakfast for the kids, it’s just that it doesn’t occur to me. It seems there is always somewhere to go for at least one of us, so arranging a time for all of us to enjoy breakfast can be challenging. The more I thought about it though, the more I realized that I might be missing out on something here. There aren’t that many weeknights where we all gather around the table at the same time. But weekends are a little different. I could make Sunday pancake day if I wanted to and the kids would love it! These days, my kids can pitch and help make breakfast too! 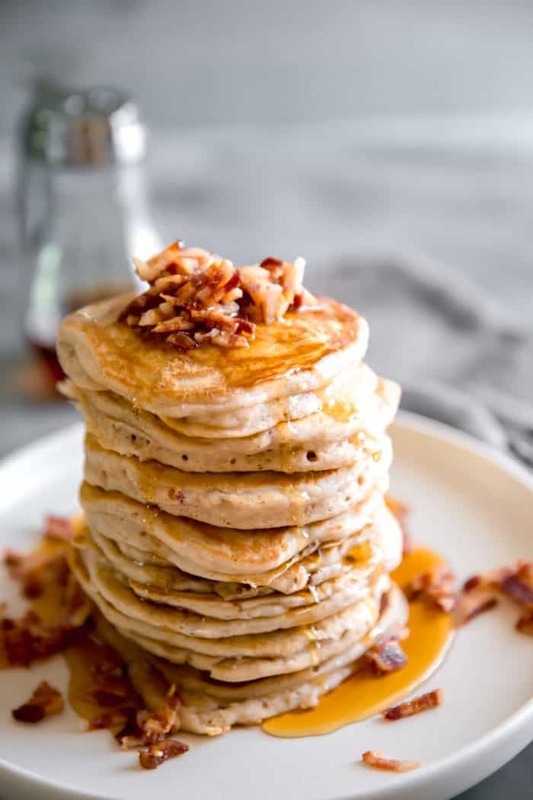 Each of my kids can make this easy pancake recipe (no pancake mix needed), so breakfast can be a group effort! Gone are the days when you bought a box of pancake mix, added some milk and eggs and went to town making pancakes. 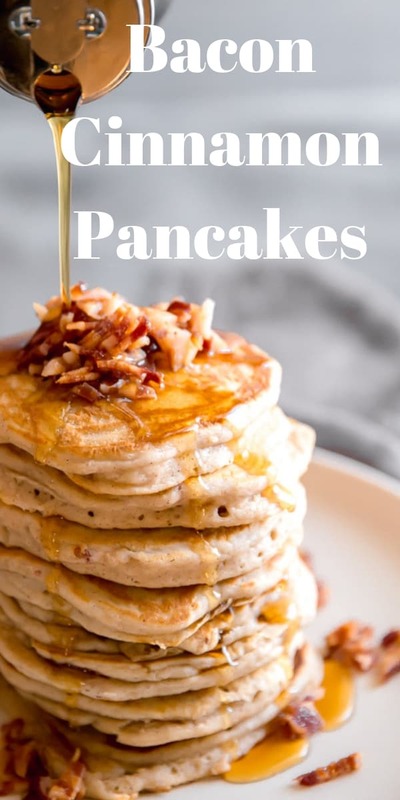 You DO NOT need that mix, pancake batter recipe is easy and homemade pancakes are so much better, I promise! 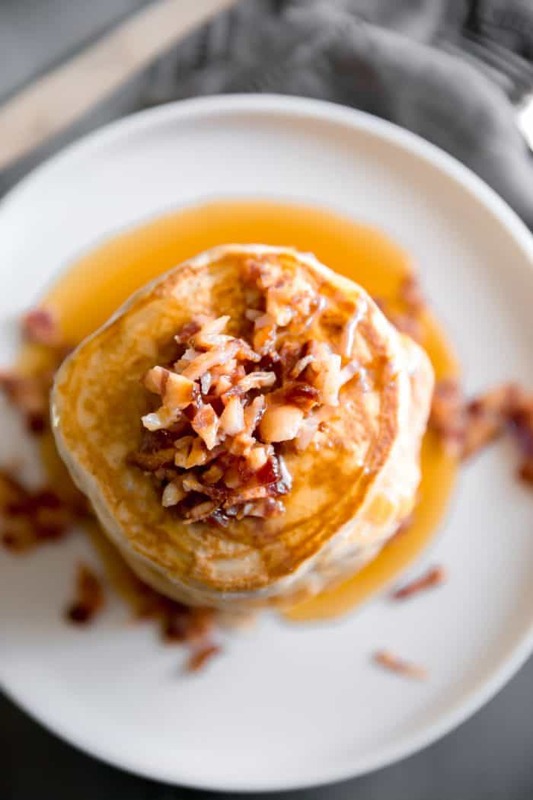 This recipe starts with a little bacon…because that is what is going on top of your pancakes! Sure you could totally skip this step and eat your bacon on the side, but everyone knows that bacon and syrup are a killer combo! I take thick slices of bacon and sprinkle them with brown sugar. The bacon is arranged on a foil lined baking sheet (arrange them on a baking rack if possible) and bake for 20 minutes. This will give you sweet, crisp, caramelized bacon that is like candy! While the bacon cools, prepare your pancakes. WHERE IS THE EASY PANCAKE RECIPE? 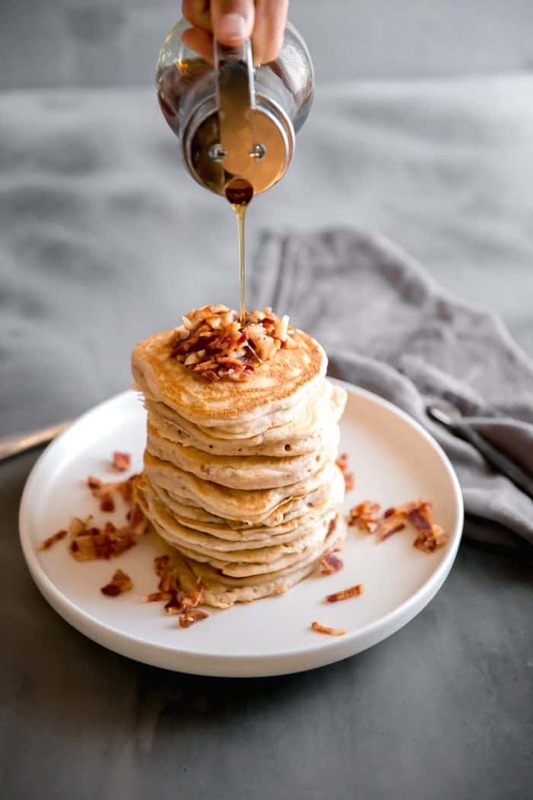 If you’d rather skip cooking tips, suggestions, handy substitutions, related recipe ideas – and get straight to the Easy Pancake Recipe– simply scroll to the bottom of the page where you can find the printable recipe card. In a large bowl, whisk together flour (all-purpose), baking powder, sugar, salt, and cinnamon. Feel free to adjust the amount of cinnamon in this recipe so that the flavor better suits your tastes. There is a fair amount of baking powder, but you want enough baking powder to give you fluffy pancakes! Add milk, an egg, and vanilla to the dry ingredients and mix just until incorporated. That right there is the base of your batter! At this point, you can chop up the candied bacon and add some to your batter or keep it as a topping only. Heat a large skillet over medium-high heat. When the skillet is hot, reduce the heat so that now the skillet is over medium-low heat. This will prevent the pancakes from browning too quickly. Add a pat of butter or a teaspoon of melted butter and then ladle or scoop about a ¼ cup of batter and pour it on the hot skillet. Pancakes will not take long to grill up golden brown. Watch the pancakes cook, you will know the pancakes are ready to be flipped when air bubbles begin to form. Carefully flip the pancakes and heat the second side for only a minute or two. If I am making a big batch, I keep the oven on a very low temperature and as I am finished with a batch of pancakes, I place them covered in the oven to stay warm. Yes! We always make a double batch to freeze for busy mornings. Make sure your pancakes are completely cool. Arrange the pancakes in a single layer on a baking sheet and place the baking sheet in the freezer. When pancakes have frozen, stack the pancakes with sheets of parchment paper in between in each pancake. Place the stack in a zip top bag. The pancake should keep for 1-2 months. 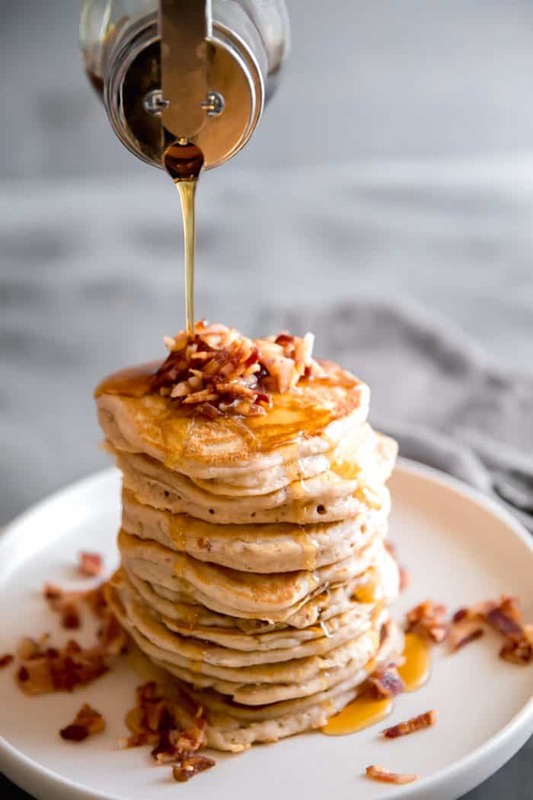 The beauty of having frozen pancakes is that when the craving hits or when you need a quick breakfast, they are ready and when waiting for you. 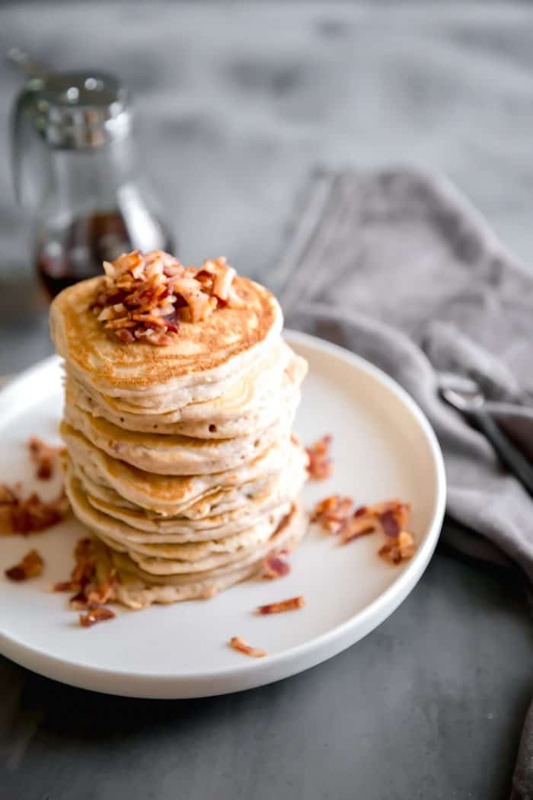 Here a few ways to reheat frozen pancakes. Microwave the pancakes. I would arrange your pancakes in layers and microwave in 20-second intervals until heated through. To reheat pancakes in the oven, preheat the oven to 375 degrees. Place pancakes in an even layer on a foil-lined baking sheet and bake for about 10 minutes. Lastly, you could use the toaster. Place one pancake in each toaster slot and warm until heated through. I personally find that the toaster doesn’t seem to heat my pancakes evenly. 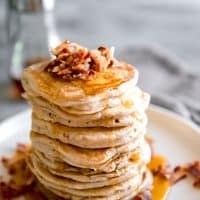 Other Ways to Flavor These Easy Pancakes? As mentioned above you could omit the bacon and add banana slices, blueberries, nuts, chocolate chips or cinnamon chips instead. If you don’t want maple syrup then blueberry or strawberry syrup would be lovely as would a dusting of powdered sugar. Love these pancakes? Then you need to try these Banana’s Foster Pancakes , and these Toasted Coconut Pancakes! And if you are loving the sweet bacon combo, then check out these Maple Bacon Sugar Cookies! 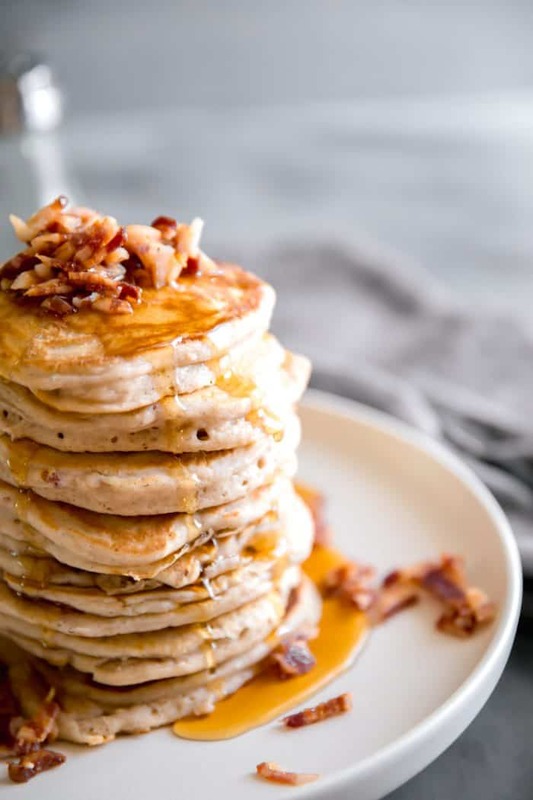 Breakfast for dinner is such a treat, especially when it involves homemade pancakes and brown sugar bacon! Preheat oven to 350. Line a baking sheet with foil. Arrange bacon on foil and sprinkle with brown sugars. Cook for 20 minutes, turning bacon half way through cook time. Let cool completely before chopping. In a bowl, combine flour, baking powder, salt, sugar and cinnamon. Make a well in the center of your dry ingredients and carefully mix in milk, eggs, butter and vanilla. Stir in chopped bacon, reserving a tablespoon for your topping. Heat a griddle pan or a skillet, using buttery spread to grease your pan. Ladle about ¼ cup full of batter. Brown pancakes on each side. I am in LOVE with this bacon Tanya! YUM! Anything tastes good with bacon, and candied bacon…even better! So delicious! Thank you, I agree bacon makes everything better! I agree with you on the breakfast for dinner thing! I would eat these ANY time of day. Thank you Marcie! We ate these for lunch too! Love how you love the “real” bacon! To each their own. But seriously, bacon is not ON inside of a turkey! This recipe is amazing, Tanya! Pinning onto my Pancake Board! No, no bacon in turkey! Lol! Thanks Gloria! Thank you Gloria! I hope you enjoy them! You found something to make 🙂 Looks awesome! This is making the bowl of instant cream of wheat I’m going to eat later at work seem so sad. I absolutely love candied bacon. I can’t wait to try this recipe. I imagine it is hard to look at cream of wheat after these, I’m truly sorry! Thanks Meghan! Um, I ate a lot of the topping on its own! Candied bacon!? Omg yes. I’m in. Wish I could share Ashley! Mmmm! I can almost taste the bacon now! Sounds delish! I find, however, that I don’t need anymore reasons to love bacon, I just do! I’m more a fan of the real deal as well, but my hubby prefers turkey bacon. I don’t mind it, but it’s just different. It is different, but I guess I would eat turkey bacon too, if I had to! Thanks Loretta! Oh my! I might have to make these! I’m a big lover of cheating dinner and making breakfast instead. This just sounds divine! Breakfast is a much easier meal isn’t it? Thanks Elizabeth! 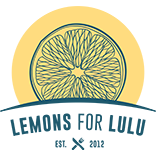 Breakfast for dinner is a once a month Sunday night tradition and this is on tap for the next one – pinning! Oh my heavens! These look incredible! 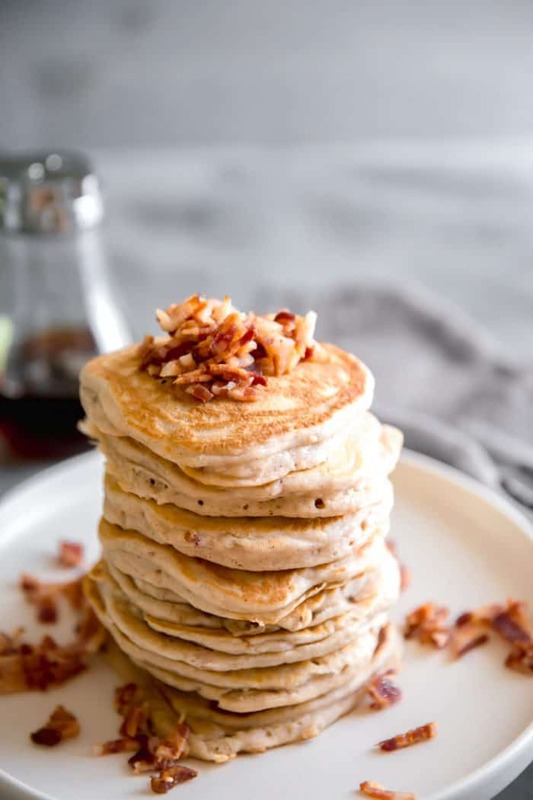 How can you beat pancakes and bacon for any meal? Pancakes and bacon. Two of my favorite breakfast items! These look good, Tanya! Pinned to my food board! Holy Moly!!! These pancakes look absolutely amazing! I love breakfast for dinner and now I know what we’ll be having next time. Yum! Thanks Kate! This is the only meal know one complains about! I’m always starving so I totally understand! But the candied bacon as good. Oh I love candied bacon lately! These pancakes look fabulous! I really need to make breakfast for dinner more often! I made these this morning for my husband for our anniversary. We both love bacon! I dont know if it was something I did wrong (mis-measured or didnt mix it up well enough? maybe, it was early!) but some of the pancakes tasted salty or bitter. My husband thought it might be from the baking powder. Sadly, they didnt turn out at good as they sounded! 🙁 Might have to try them again and see if it was my mistake. I like that you respond to bacon! I do too! We do breakfast for dinner often! We are big breakfast lovers also. I do see a problem with having this recipe on the menu. With my love for bacon , I am not sure any of the bacon would make it to the table.